What is the key to unique art? Using things in interesting ways. 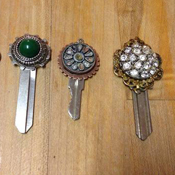 Here are a few projects where people used actual keys in art, with beautiful results. 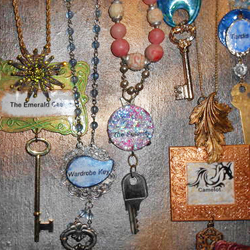 bookstorebabe made key pendants to fantasy locations like Camelot, the Tardis, and the castle of Emerald City. These necklaces definitely unlock your imagination. Embellished keys are pretty in their own right. bunny1kenobi used jewelry findings to make these beauties. 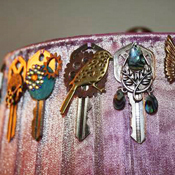 And here’s a great use for embellished keys: yzzilnoaj attached altered keys to the top and bottom of a lampshade for a unique look. 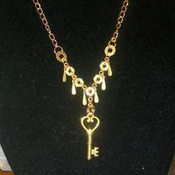 Tidbits_Trinkets used hardware to help accent her key on this steampunk necklace. Keys can be used to embellish all sorts of art. Here’s a detail of a scrapbook page by mrogers1, who also used buttons and ribbons on this great layout. What’s the key to your beautiful art? 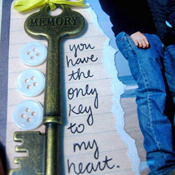 To see more projects using keys, click on the Craftster tag “key“.